The astonishing diversity and concentration of wildlife, from the immense Serengeti and towering Mount Kilimanjaro to the remote national parks of Katavi and Mahale are what gives Tanzania its appeal of 'Real Africa'. Tanzania also boasts over 1 000 bird species, and Lake Manyara is a year round birding destination. Tanzania incorporates the Zanzibar archipelago, the fertile, coral islands of Zanzibar and Pemba. Tanzania's habitats range from afro-alpine to semi-desert and offer excellent game viewing throughout the year as not all animals migrate and are year round residents. Zanzibar, the very name conjures up images of sun soaked, white beaches stretching to the far horizon, lined with palm trees. Of the scent of tropical spices wafting on the air, as the cloves dry at the side of the roads. Of fresh fruit, ripe and glistening ready to be eaten or fresh seafood lovingly prepared and served to you as you lounge on a Zanzibari bed by the pool. The archipelago of Zanzibar includes Unguja and Pemba Islands and numerous smaller islands. The main island is Unguja, which is usually improperly called Zanzibar. Stone Town is the capital, with its winding convoluted streets, ornately carved doors, churches and minarets and neon signs it is a fascinating mixture of culture and ages. Steeped in history, it is a proclaimed world heritage site. The more modern part of Zanzibar, the luxury resorts, are interspersed by traditional Zanzibari villages where you can see happy smiling children playing inventive games, showing a charming juxtaposition of old and new. Dolphins, tropical marine fish, warm ocean currents and turtles makes snorkelling or scuba diving very rewarding all around the island. Safe beaches, watersports, spas, luxury resorts, history and culture - Zanzibar has something for everyone. Serengeti is 14,750 Km2, which to give some perspective, is larger than Ohio, Belgium or Wales. It is an UNESCO world heritage site and the migration recently lauded as one of the seven natural wonders of Africa. Its unique composition and diverse habitats supports over 30 species of large herbivores and close to 500 species of birds. Volcanic action formed the Serengeti’s vast plains and rolling hills and over the years wind, rain and sun have all sculptured the Serengeti in to the contours it has today. In the southeastern part, during the summer months of December to March the open plains are awash with wildebeest, zebra and gazelles, which prefer the short palatable grass in this area. This is the time of aplenty, of pregnancy and of birth. The central area is savannah with scattered acacia trees and rocky outcrops. The Seronera Valley is in the centre of the Serengeti, named after the Seronera River, which provides the only source of permanent water in this area. Millions of wildebeest, zebra and gazelles pass through this area during April and May, as the herds start to move north in the search for better grazing. The great migration is a circular movement so they also pass again through this area, dependant on the rains, around late November and December. The west has extensive woodland and black clay plains; here you can find large herds of buffalo and elephants. In this area is the Grumeti River, where exceedingly large crocodiles live. The yearly wildebeest river crossing provides the crocodiles with their annual feed. The migration is usually in this area around June to July. The northern part of the Serengeti is a hilly, wooded grassland that borders the Masai Mara. Around June to October the migration herds tend to bunch together as they reach their most serious obstacle to get to the fresh grazing, the Mara River. To get into the Masai Mara the herds have to cross this river, which after the rains, is fast flowing and swollen, with of course the waiting hungry crocodiles and large cats which wait for some easy prey. The great herds cross into the Masai Mara as it receives more rainfall than the Serengeti. The antelope are constantly feeding as they traverse from one area to another, continually looking for better grazing. The northern parts of the Serengeti is rich with wildlife as they head in and out of Tanzania. Typical of all wild animals, they are unpredictable and can move from area to area with no rhyme nor reason; the wildebeest are no exception. They will often cross the rivers after much trepidation and fear, only to turn around and head back from where they have come from. With a silent signal they will all turn and gallop off, chasing the thunderstorms only to return to the same place the next day. Even after tracking the migration movements over many years, it is still completely unpredictable as to where the migration will actually be at any given time. Records show a distinct pattern of where the animals are likely to be, but the actual movement is open to the vagaries of the rain, the grass and the animals themselves. There is resident game throughout the Serengeti National Park and its conservancies, as not all the herbivores migrate. The large cats and other predators are territorial and so take advantage of the great herds passing through their territories but do not follow them on the migration. In the Serengeti, many permanent camps and lodges offer magnificent year round game viewing. Outside of the migration times, they also offer discounted rates. During the migration time in each area, the tourist population increases, as does the amount of vehicles all trying to see the same spectacle. Whereas out of season, there is still great game viewing without the masses of cars searching for it. There are also mobile camps that move position in relation to where they predict the migration will be. They do not move whilst guests are in camp, but stay in position for a number of months, waiting for the migration to pass near their area. Generally the mobile camps are in the southern area from December to March, western area June to July and the northern area July to October. Please do not hesitate to contact a Siyabona travel consultant to advise you on the best area to be or for the camp that will suit your safari needs. Three volcanic craters dominate the Ngorongoro Conservation Area, with the Ngorongoro Crater being the most famous and largest. In fact, it is the largest unflooded, unbroken caldera in the world. It is about 20kms across, 600m deep and 300km2 in area and holds an astonishingly large array of wildlife. 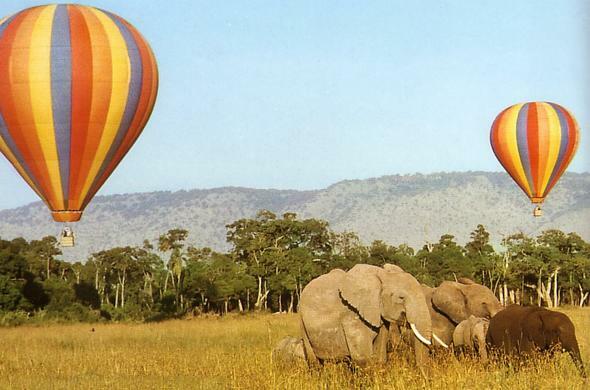 It is possibly the best place to see the ‘big 5’ in Tanzania. The crater is home to lion, leopard and hyena who prey on the wildebeest, buffalo and zebra. There is a large population of black rhino and a good place to see some large tusked elephants. Migrating herds, usually late November and December inundate the greater crater area, however there is a high density of resident game throughout the year. The Ngorongoro Conservation Area strives for a peaceful coexistence between man and animals, therefore Maasai pastoralists continue to walk this area, as they have for centuries. The Maasai are very distinctive in their red dress, seen herding their cattle. The whole area contains over 25,000 large animals, the vegetation is a mixture of lush green, rain watered plants and desert plants. There is an abundance of short grass, great for grazing, and highland forests. In the west is Ndutu Lake, which has a healthy population of cheetah and lion. On the leeward side of the Ngorongoro highlands is Oldonyo Lengai, an active volcano that last erupted in 2007. It is Tanzania’s third highest mountain, after Mount Kilimanjaro and Mount Meru. At the foot of the mountain is Lake Natron, a soda lake, made famous for the numerous breeding flamingos found there. Olduvai Gorge National Park is a small park also known as the cradle of mankind. It is one of the most prominent paleoanthropologist sites in the world. Some of the findings here have shaped our understanding of early human evolution. At Laetoli, west of the Ngorongoro Crater, are humanoid footprints, preserved in the volcanic rock. They are thought to be over 3.6 million years old and represent the earliest signs of mankind so far that has been found in the world. Covering an area of 137 square km, Arusha National Park protects a remarkable diversity of habitats. The eastern slopes and 4566 metre-high peak of Mount Meru, the fifth-highest mountain in Africa, lie within the park. Ngurdoto Crater is a fully intact 3km-wide, 400 metre-deep volcanic caldera with a forest-fringed rim and lush green floor. Another attraction are the Momella Lakes, a group of shallow alkaline lakes fed by underground streams. They all have different mineral contents and are slightly different in colour. The lakes are some of the best places to see water birds in Tanzania: Flamingo, Pelican, little Grebe and a variety of Heron, Duck and Wader are common. Buffalo, Elephant, Hippo, Giraffe, Zebra and a variety of Antelope are regularly seen in the park. Blue Monkey are common in all the forests, and black-and-white Colobus can be seen on Mount Meru and on Ngurdoto crater rim. The only large predators in the park are Leopard and spotted Hyena. As the largest game reserve in Africa with an area of about 21 000 square miles (55,000 square km), the Selous Game Reserve carves out a huge portion of Southern Tanzania. The immense size of the park makes it ideal for the traveller seeking a sense of isolation, exploration, and discovery. Few other vehicles will be visible. The Selous is a UNESCO world heritage site due to its diversity of wildlife and undisturbed nature. The majority of the reserve is set aside for hunting, controlled by a number of privately leased hunting concessions. The northern section of the reserve is solely for photographic tourism and follows along the Rufiji River. The Selous is a premium reserve to visit as it offers such a wide range of accommodations and activities. Alongside the traditional game drive, walking safaris, fly camping and boat safaris are also available. Over a three night or more stay in the reserve, you can experience an array of adventures using different modes of transport, exploring various areas of this vast reserve. The reserve is home to over a third of Tanzania’s elephants and the best place to see the wild dogs. The Rufiji River runs through the park with many deltas and lakes branching off throughout. In some areas it looks like a tranquil European park, with a picturesque calm lake surrounded by large trees and a cropped lawn; until you see the flick of a hippos ears, the splash from a crocodile leaping to catch an unwary water bird, all observed by the leopard languishing on a tree branch. The Selous Game Reserve is seasonal open from June to end of March and closed for the long rain season due to the black cotton soil making the roads impassable. The first Europeans to encounter Lake Tanganyika were the British explorers Richard Francis Burton and John Hanning Speke, in 1887. Beginning on the eastern coast, they crossed Tanzania in search of the source of the Nile, finally coming upon the shores of this seemingly endless and bottomless body of water after months of great deprivation. Though this was not the mythic headwater of the great Nile (it is actually Lake Victoria, to the north), the sheer size of this lake, the world's longest at 446 miles. (714km), made it a geographical bonanza in itself. At the northern end of Tanganyika is Gombe Stream National Park, where Jane Goodall conducted her celebrated studies of Chimpanzee. Mahale Mountains National Park borders Lake Tanganyika and is home to possibly the last remaining wild chimpanzees in Africa. The terrain is mostly rugged and hilly dominated by the Mahale Mountains. The park can only be reached by boat, it is a totally road free area. Walking safaris, tracking the chimpanzees, and taking time to observe their daily routine be it allogrooming, squabbling, foraging or feeding, are an awe-inspiring treat. Here you can go hiking the forest paths or scrambling up the mountainside looking for butterflies, birds, and hidden mammals. Splash in the mountains icy cold pools and waterfalls, paddle a kayak into the lake to watch the sunrise. Laze on the beach or take a rod and go fishing. A wonderful destination for a different type of safari experience. This small park is in a strip of ancient forest on the northern shore of Lake Tanganyika. Made known from the research Jane Goodall started on chimpanzees in the 1960’s. The majority of mammals in this park are primates, many of which are habituated to humans, especially the chimpanzees and olive baboons. High up in the tree canopy you can glimpse red tailed and red colobus monkeys. Leopards are at home in this forest, as are bushbuck and elephants. You can listen to the haunting call of fish eagles and view palm nut vultures circling above the tree canopy. Gombe Stream National Park with its steep valleys and thick forest is a hidden gem for the off the beaten track safari goer that enjoys walking safaris. The beauty and charm of this remarkable park is its remoteness, resulting in fewer visits in comparison to other parks in Tanzania. Yet, it is Tanzania’s third largest park, with an ecosystem stretching into numerous forest and game reserves, it totals 25,000Km2 of rich wildlife. The Katavi National Park is open from June to February; it enjoys two distinct seasons. From June to October it is the dry season, where the animals are concentrated around the seasonal rivers and lakes, which are rapidly drying. This forces the wildlife into becoming more condensed, especially the hippo population, which have become forced to share the ever shrinking pools of water. The hippos forego their territories and pile up next to one another in an attempt to find some relief from the burning sun. The crocodiles go into hibernation inside caves excavated from the riverbank mud walls. Large herds of elephant and buffalo stay near the rivers to ensure they have enough to drink.The grass becomes a high dusty vision of gold all across the plains, a great place for the lions, hyenas and other predators to skulk knowing their prey is at a big disadvantage. This is truly Africa in the raw. Then come the rains, usually from mid-November to the beginning of June. The grass becomes green and lush almost as soon as the first drops of moisture hits the earth. New grass shoots appear as if by magic and the game spreads throughout the park enjoying the new life injected into the invigorated land. The bird population increases with migrants flocking to take advantage of this abundance of water and food. It is a beautiful time to visit, especially for birders. From the end of February until June the camps close as the rain becomes heavier and the black cotton soil makes the roads impassable. Rising 5895 metres (19340.5 feet) above the African plain, Kilimanjaro truly stands alone among the mountains of the world. The huge, solitary volcano is unaccompanied by any mountain chain. Though its size is immense, it also has one of the world's most accessible peaks. People who are in good shape can make the ascent to its summit, Uhuru peak, in a matter of days, passing through 5 distinct ecological zones along the way.The lower slopes of the mountain are defined by coffee and banana fields that rise up and end where the mountain's forest begins. An average of 80 inches of rainfall a year make the forest home to some botanical treats. Tree ferns in this region are known to grow up to 20 feet, and giant lobelia often reach 30 feet. At an altitude of about 9,000 feet, the forest gives way to grasslands and shrubbery, and Elephant can sometimes be spotted roaming the high slopes. At about 13 000 feet life begins to recede, a result of extreme weather conditions inhospitable to anything more than small Moss and Lichen. Once the summit area is reached, 3 glaciers and 3 volcanic peaks sit in lofty, placid contemplation of the tremendous plains over 3.5 miles (5.63 km) below. It is highly advisable to take the mountain slowly. The thin air is a well-known killer of impatient weekend climbers, who misjudge their abilities and ascend too fast. Altitude sickness is common and can be fatal. No climb is permitted without a guide, and there are 6 routes up the mountain with varying degrees of difficulty. Huts are available at different points along the way, and the final ascent begins near midnight (so melting snow isn't a problem) and culminates with a spectacular sunrise at the peak.